Could a Supreme Court justice be president? Bill Kristol, whose major political contribution to American public life is the national career of Sarah Palin, has another bright idea to free the Republican Party from the looming prospect of a Donald Trump presidential candidacy. The GOP, he writes, should turn to a dark horse from an unlikely source. After naming several long-shot contenders such as Mitch Daniels and Paul Ryan, Kristol essays the presidential equivalent of a two-handed shot from half court. Why not, he inquires, Justice Samuel Alito from the Supreme Court? Never mind that Justice Alito has never expressed interest in the White House and would have to give up his seat to make the race. A man of Alito’s intellect would save the party from the oafish Trump whose slogan on his hat embodies his program to make America great again. Has this potential departure from the Court ever happened before or is the gadfly Kristol innovating again? The Republicans faced such a dilemma once before in American history. Against President Woodrow Wilson’s campaign for a second term in 1916, the GOP lacked a strong presidential nominee to counter the resurgence of former president Theodore Roosevelt who hated Wilson, advocated for intervention on the Allied side in World War I, and seemed an unpromising candidate against the sitting president. Several Republican hopefuls pressed to be nominated, but a motley assortment of senators, governors, and also-rans caused no excitement comparable to what the charismatic Roosevelt stirred. Salvation seemed at hand on the Supreme Court. Justice Charles Evans Hughes, appointed to the Court by William Howard Taft in 1910, seemed the ideal solution. Formerly a reformist governor of New York (1907-1910), Hughes had no baggage from 1912, when Taft and Roosevelt fractured the party. He was a man with no personal blemishes who could lead the Republicans back to the White House against the unpopular Wilson. Republicans of the era hated Wilson with a venom reminiscent of how modern GOP members hate President Barack Obama. “Charles Evans Hughes, Chief Justice of the Supreme Court. 9 September 1931.” Via the Library of Congress. 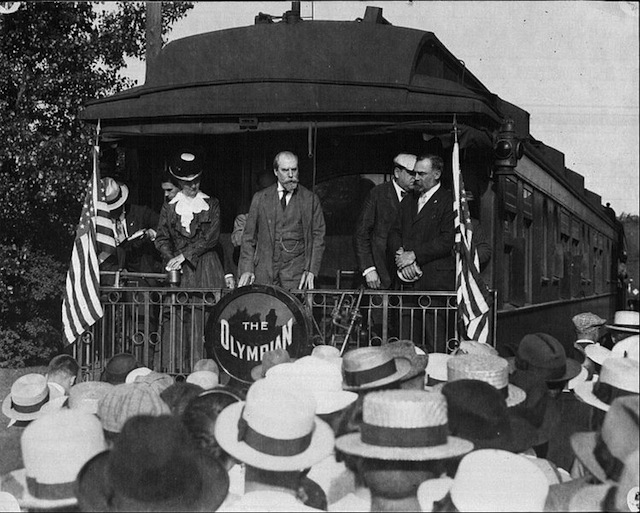 “Charles Evans Hughes campaigns in Winona, Minnesota on the Milwaukee Road’s Olympian”. Via Wikipedia Commons. Though the election was close, Democrats boasted that Wilson had “kept us out of war” and those sentiments won the president a second term. Wilson carried the crucial state of California and won 277 electoral votes to Hughes’ 254. Republican Party members disavowed “smart” candidates like Roosevelt, Taft, and Hughes, which won Warren G. Harding favor in 1920. Hughes returned to private life, but years as Secretary of State and Chief Justice of the United States lay ahead of him. No viable candidate has emerged from the Supreme Court since Hughes (unless we consider the feckless antics of William O. Douglas). Given the cavalry-charge nature of the current Republican presidential race—and the prospect of a campaign against Trump—it would not be surprising if Justice Alito, a smart man, considers Hughes as precedent and ignores the aggressive punditry of Bill Kristol for the lifetime security of a seat on the Supreme Court.